In today's class, we're going to learn about ADO (ActiveX Data Objects) which is a different way of working with recordsets - ADO is slightly different from DAO, and it has its own uses. We'll talk about those uses in today's class. We're also going to build a sample project, a Student Test Taker, where we'll do lots more with recordsets, and we'll learn lots of new techniques and functions. We'll start by going over the available References, and you'll see how to enable ADO (ActiveX Data Objects). You'll learn how to create an ADO connection, set the CursorType, LockType, and lots more. 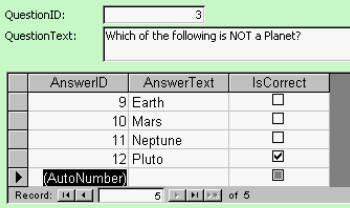 Next we'll use our Recordset skills for a little project: we'll build a student test taker (quiz) program. We'll start out with a form/subform for the teacher to input questions and correct answers. 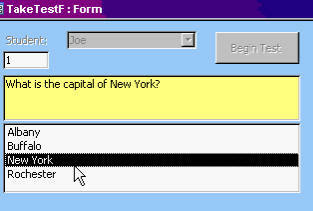 Then we'll build a form where a user has to log on and then take the test. All of his answers will be logged in the database using a Recordset. Then we'll build a nice report to summarize each student's results. set the vb code up and get an error when I put Dim Con As New Connnection I get a compile error stating invalid use of keyword. Richard Rost on 5/22/2009: Bryan, what version of Access? Did you make sure you have the Reference set up? Richard Rost on 5/26/2009: Bryan, I just set it up and tested it again on two machines and it worked fine for me. Without looking at your computer I can't tell what the problem is. Make sure the DAO reference has a higher priority than the ADO one. Try it in a different (blank) database? Maybe there's something corrupt in that one. "Because Access offers two different object models for the purpose of working with recordsets, you may find recordsets confusing. 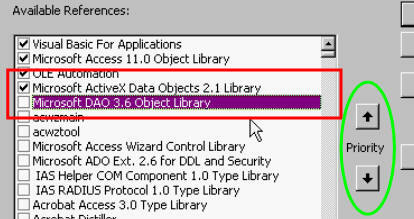 One is DAO (Data Access Objects); the other is ADO (ActiveX Data Objects). The DAO model is the older of the two. DAO works only with Access tables. ADO, the newer of the two, works either with Access tables or external data sources, such as Oracle and Microsoft SQL Server. At first glance you may think, “Well, I’ll never use external data sources, so I’ll stick with the DAO object model.” Picking an object model, though, isn’t that easy. The newer ADO model is currently favored by Microsoft, meaning that ADO will continue to grow and get better while DAO remains in maintenance mode, which generally spells doom for a technology. If a technology is in maintenance mode today that pretty much guarantees that it won’t exist at all in the not-too-distant future. Given the bias of Microsoft, we stick with ADO in this book." For me, I understand that DAO is used for Access only and ADO is more generic as you mentioned in Access 323 but I need to hear your opinion in this issue, which one is the best DAO or ADO take into consideration Access 2007 and 2010? I go into much more detail in my seminars and lessons, but basically DAO is a model that is more specific to Access and gives you more control over Access - including design of the tables. ADO is more generic, applies to other database types, and can be used in online databases (like I show in my ASP classes). Both are just fine for basic use. I actually mix and match between them a lot. Microsoft is actually focusing on DAO for the future even though it is the older of the two standards. I personally say it can't hurt to learn them BOTH. The databases were all moved here: http://www.599cd.com/access/StudentDatabases/. 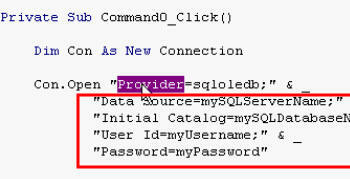 The passwords for the advanced databases are the same as your installation password for the course. See that page for more info. Kenny Nelson on 12/8/2015: We use SQL Server for our file handling so I use the ADO model in Access. Is it OK to use ADO to handle our true Access tables also? Are there any ill effects from using ADO over DAO for this? It's more person preference, there are benefits for an against. Richard Stockstill on 4/25/2018: I bought/viewed 320 thru 323 in lieu of Dev-8, etc. It would be interesting to see how to have the test taker randomly pick 10 questions from a Table of 50 questions but without picking the same question more than once per testing instance. Thoughts ? Have you taken Expert 26? Random is covered in that which could be a starting block.